« 1 000 000 metres on the ergometer! 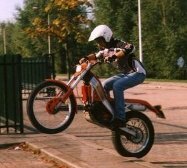 About ten years ago I bought a 1992 Montesa Cota 311 trial motorcycle. I like playing around with this bike, it’s a lot of fun. Besides riding a trial improves you riding skills a lot, something useful for my greenlaning. The Cota weighs only 80 kilos and you have to stand on the pegs all the time. Because it is almost impossible to hurt yourself or to damage the motorbike you are more willing to try new things, especially riding obstacles like tree lumps, a field with large stones or simply riding on curbstone on the edge of the pavement along the street. Trial is all about keeping balance. It seems simple but riding a curbstone for more than 10 metres is quite challenging! One day I searched the Net for a how-to riding trials. I discovered several Observed Trials Coaching manuals that gave plenty of how-to on my basic questions. Then I discovered something different. Grown up men riding small sized bikes without the constraints of gravity. This was biketrial. Soon I discovered that biketrial is mostly a Spanish thing to do (later I found out that this sport is done all over the world but not that many). I also found some great sites explaining how-to. One of the fathers of biketrial was Pere Pi. Himself being a motorcycle trial rider and worker at the Montesa factory wanted his son Ot to try it too. It was told that after some bigger crashes Pere decided to let his son do the same thing on a regular but adapted pedal bike. With the aid of the Montesa factory he was able to build the first specially made biketrial bikes. This was when the brand Monty was born. In Spain biketrial was called trial-sin — trial sin moto, trial without engine. In fact Ot Pi became one of the best triallers in the world and stayed one of the best for about 30 years. Other biketriallers later switched to motorcycle trial and became the best like Tony Bou, Jordi Tarrés. Other sportsmen were advised by their physical trainers to use biketrial for practice like Marc Coma, the Spanish Dakar rider. For me biketrial was a new adventure. I always liked bicycling and with mountainbiking the technical sections were favourite. At slow pace conquering roots, logs and stony streams in the Belgian Ardennes. 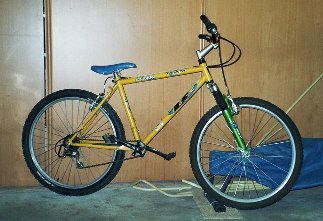 Because I first wanted to try I stripped all the unnecessary parts of my mountainbike, equipped it with a 2.5 rear tyre and motocross handlebars. The result was amazing! Although not that easy I managed to climb up and down ridges having a lot of fun. Soon after I bought a real biketrial bike, a Monty Alp 219. The 219 Alp is a so called Mod with 20″ wheels. 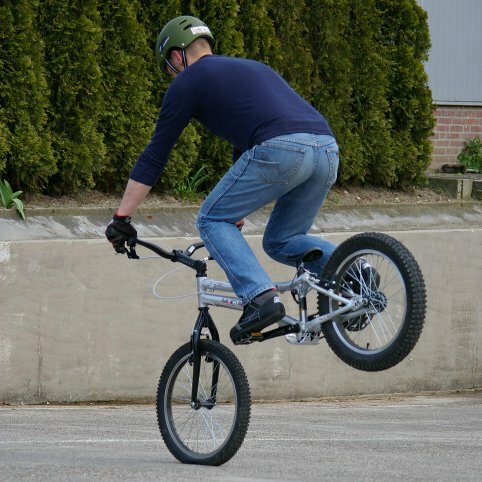 It is maybe more difficult to ride than a 26″ trialbike, more agile and certainly great fun! On most biketrial websites you can find the different characteristics of 20″ versus 26″ bikes. Then about the riding technique, the point where it all started for me. One site in particular is very complete: Trash Zen. It describes all the basic moves and tricks step by step and is richly illustrated with videos. I think it’s not only a must see for triallers but also for mountenbikers. This site is correct in stating that biketrial is in fact Zen art — the ultimate concentration on only on thing you do that very moment. For the rest YouTube and a lot of dedicated sites provide lots of material to see how fun trial can be. Personally I very much like the easy and controlled style of Gerardo Garcia. Unfortunately his website is no longer there but you can see him on YouTube. This entry was posted on 22 April 2010 at 23:41 and is filed under Biketrial. You can follow any responses to this entry through the RSS 2.0 feed. You can leave a response, or trackback from your own site.